Pawpaw trees(Asimina triloba) are unique because most of their closest relatives are tropical species, but these trees are not. 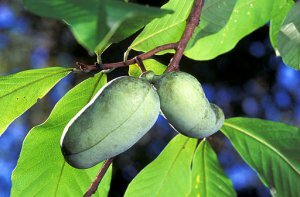 Pawpaw trees are native to temperate climates of eastern and central United States and southern Canada. This USDA map shows their range in the U.S. and Canada. Pawpaw trees are in the same plant family as tropical fruit trees such as cherimoya, soursop, and sweetsop. The spelling of pawpaw varies and includes paw paw, paw-paw, and papaw. The pawpaw tree is a medium size tree typically only reaching 35′. It is very hardy and disease resistent in its growing range. This makes it very valuable to organic farmers because pesticides do not need to be applied for this plant to thrive. One major downside for organic growers is that pawpaw fruits do not preserve well compared to other fruits. This tree is known for its pawpaws but It also makes a great landscape plant with one minor problem. It reproduces by sending up suckering shoots similar to the sassafras tree, these suckering shoots may be aesthetically unappealing in a landscape, but regular maintenance can keep them down. You can buy pawpaw roots online to grow your own trees at home. Pawpaw fruits are elongated oval fruits with a smooth thin skin. The interior of pawpaw fruits have a consistency that is often described as custard-like. There are large seeds through the center of the fruit that must be removed before eating, the seeds are very hard and somewhat toxic. Pawpaw fruit taste is what makes this plant so interesting. It has what I would describe as a tropical flavor. It tastes a little bit like a banana but different . The taste is very difficult to describe in words since it is such a unique flavor. Although they have different tastes and are very different plants the pawpaw reminds me of kousa dogwood which is another temperate tree with fruits that I would describe as a tropical flavor. Pawpaw flowers bloom in spring and the fruits fully ripen in fall. Unripe pawpaw fruits taste awful and might make you a little sick, you will know they are ripe when they just start to get slightly soft to the touch. Fruits will often fall off the tree when they are ripe enough to eat and can be picked off the ground. There are many ways to eat pawpaw fruits: they can be peeled and eaten around the seeds, they can also be cut in half and seeds removed then spooned out avoiding the skin, Or you can just eat them with the skin on avoiding the seeds but the fruit skin does add a slightly bitter flavor. Pawpaw fruits do not last long after they are picked, to extend their season of use unripe pawpaws can be made into pickled pawpaws. There are some important health benefits of pawpaw fruits. The fruits are packed with nutrients including very high levels of magnesium, iron and vitamin C. It’s vitamin C levels are higher than oranges and were an important source for midwestern native Americans. 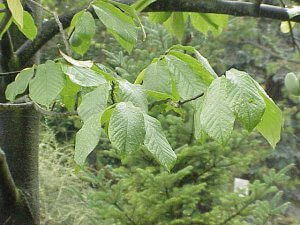 Native Americans also used the leaves for a number of external ailments such as ulcers. Recent research has shown that pawpaw plants contain very effective antioxidants at high levels similar to other fruits such as cranberries and cherries. 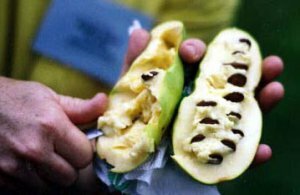 The primary caution with pawpaws is to not eat the seeds they contain a narcotic toxin that will likely make you sick. The seeds are generally not considered to be lethal and actually may have certain health benefits in the correct doses, but different people react differently and it is unknown how you will react. Pawpaw fruits even cause allergic reactions and gastrointestinal problems for some people, so if you have never eaten pawpaws before then just try one or two and give it a day to see how you feel. The leaves and fruit skins cause mild dermatitis to some people. pawpaw fruits are unmistakable in temperate zones compared to other temperate fruit trees. They are elongated ovals with very smooth skin ranging from 2″-6″ long. The fruits grow in clusters of 1-5 fruits. The immature fruit color is light green and the fruits mature to a greenish yellow color in the fall. The leaves are simple leaves with an obovate shape and a point at the tip. The leaves have visible leaf veins with a smooth leaf margin. Pawpaw trees are versatile and unique trees that are beginning to be rediscovered for their ease of cultivation and health benefits. Pawpaw fruits truly stand alone in temperate climates of the United States as a unique native fruit. Native Americans have known of their benefits for millennia. Why has it taken our modern society so long to appreciate this tree and it’s extremely nutritious and beneficial fruits.